Flowering quince (Chaenomeles) has come a long way since the days of grandma’s garden. Some shy away from quince because of its spiny thorns and bitter fruit (which can be sweetened in jams and jellies). But there are a lot of things to love about quince; it is among the first to flower in late winter. A tough, drought tolerant shrub when established, quince grows in a range of soils in full sun to part shade. Plus it’s deer resistant. While normal height is 10 feet tall, there are compact cultivars like ‘Jet Trail’ that grows to four feet. Or try one of the new thornless cultivars from the breeding team at North Carolina State University. 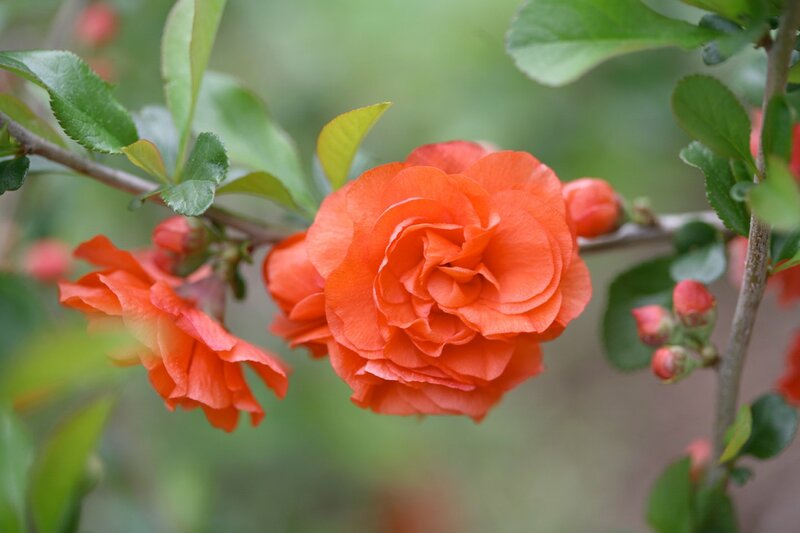 The Double Take series is compact, completely thornless and fruitless, and resembles a camellia with its doubled-flowers in red, pink or orange.